The white geese are a small group of waterfowl which are united in the genus or subgenus Chen, in the true geese and swan subfamily Anserinae. They breed on subarctic areas of North America and around the Bering Strait, migrating south in winter. 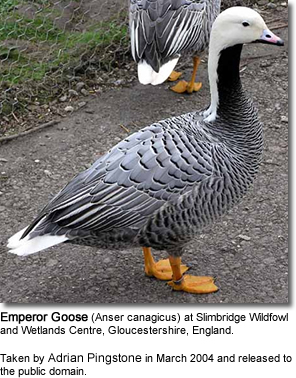 Many authorities place these species in the grey goose genus Anser. Indeed, Chen and Anser are anatomically indistinguishable. However, external morphology, biogeography, and molecular data suggest that the white geese are indeed an evolutionary lineage distinct from the grey geese - from which they split off fairly recently, essentially replacing them in North America. The AOU recognizes this genus as distinct; most other authorities today consider it a subgenus of Anser. Like grey but unlike the Branta black geese, their feet and legs are colored in reddish hues. 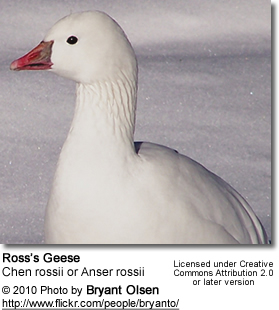 The bill is also reddish in these birds as in most grey geese, except in adult males of Ross's Goose which have a blue-black grainy cere. The wingtips are black, as in all true geese, whereas the head is always white without any markings or pattern in adult birds of this genus, which distinguishes them from all other true geese except feral domesticated geese. The rest of the plumage is either white all over, or colored in various dark bluish-grey hues; the latter birds, uniquely among true geese, do not have white uppertail and undertail coverts, though the tail itself may be white. 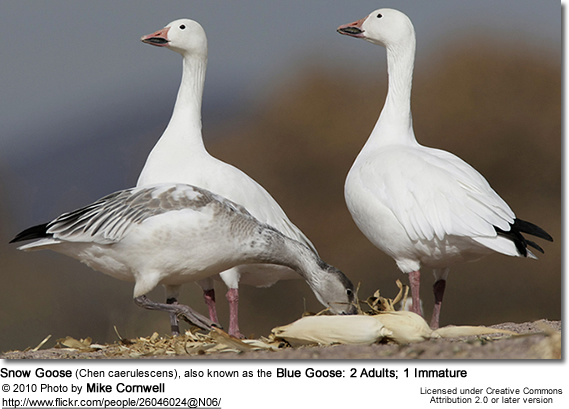 White-phase snow geese of both species can be told apart from feral geese best by the more slender, elegant neck, which is thick-set in domestic geese; these also have a generally heavier habitus and often lack black wingtips. The supposed fossil dwarf snow goose Chen pressa is now placed in Anser (Brodkorb, 1964).